December 21, 2011 - 8am. Docked at Cozumel, Mexico. Our second "foreign country" in the past 15 years ( Costa Rica was our first) . 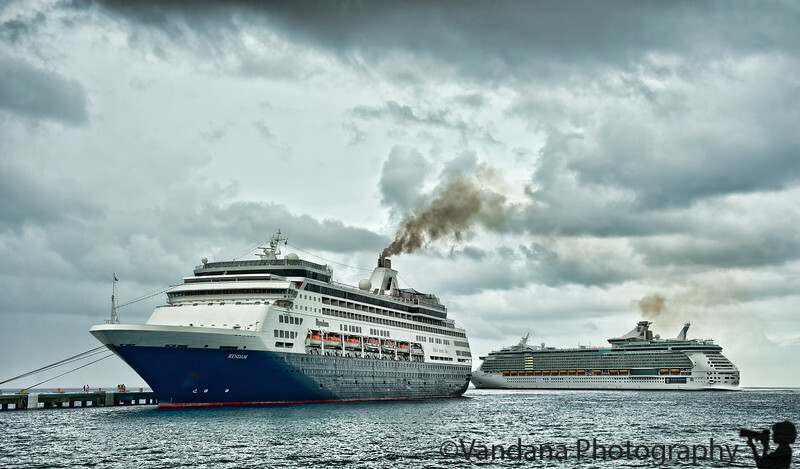 The major cruise lines dock at Cozumel - Holland America, Carnival, Royal Carribean etc. To disembark from the Ryndam, lots of frantic preparations were made. we had to wake up real early at 6am, then get to the Lido for our 6:30 coffee and breakfast, get a quick shower and assemble on Deck 3, where the authorities took our pictures, asked us to use plenty of Purell and avoid the water, and sent us on our way. BTW, this is our first picture of M/S Ryndam from the docks. We walked down the long pier and there were a bunch of tour guides standing under their names in large yellow banners. Our tour guide Jesus collected the largest contingent, keen on checking out the San Gervasio Archaeological Center. We trooped behind Jesus single file and he led us to a tour bus. There are plenty of funky transportation options in Cozumel - crazy looking motorized tricycles, jeeps, scooters, bikes - definitely a mecca for DIYers looking for a more personal experience. Jesus was a nonstop one-act comedy persona. He cracked jokes about the colossal American ignorance & stereotyping of Mexicans, Tequila, Taco Bell, the water in Mexico, human sacrifices among the Maya, on and on until the entire bus was filled with laughter. Amazing tour guide. Did you know that cops don't chase robbers in Cozumel ? Since Cozumel is an island, and there's only one gas station, the robbers escape on their vehicles, but where do they go on an island, and what do they do when they run out of fuel ? So the cops simply wait at the gas station for the poor robbers to show up! Cozumel supposedly has no drug problems that plague the Baja peninsula, no crime, but no industry either, with everything centered around the Mayan tourism industry. So we arrive at San Gervasio ruins. These are quite underwhelming, frankly. There are limestone roads and small limestone pillars and so on, but no giant structures. No Mayan temples here. But Jesus was a treasure trove on the Mayans, being a Mayan himself. Well, he was a half-Mayan half-Mestizo, and spoke Mayan, Spanish & English quite fluently. We learnt about the Mayan number system. Unlike our own ( the decimal aka Base-10 system using just the fingers), they have a Base-20 system using both their fingers and toes to count, so they get upto and beyond the millions and billions using far fewer digits than we do. We go 10, 100, 1000 and so on, but in 10 steps the Mayan get to a trillion! ( 20,400,8000, 160k, 3.2m, 64m, 1.28b, 25.6b, 512b, 1.024 T) Jesus got four volunteers to line up and we counted various numerals in Mayan by prompting them to extend their fingers. I was quite impressed by his mathematical facility, and the group as a whole became thoroughly competent in Mayan counting by the end of the tour. The Mayans had four different calendars, and the Mayan Solar Calendar is the most accurate known to man. Our own calendar based on the Gregorian system, is inaccurate by a full 6 hours every year, so once in four years we lose 24 hours, and we allocate a leap year to fix this loss and catch up. The Mayans lose only a few seconds every year! So for them to hit a reset button takes a very, very long time. And that's what's going to happen on Dec 21, 2012, the end of the world. The Mayan calendar is simply going to reset on that day. The millions of Mayans in Cozumel & the rest of Mexico, Honduras & Belize will have lots of tequila to celebrate the calendar resetting, and then carry on as if nothing happened. From San Gervasio, we went to a beach resort & had mango smoothies & cheese quesadillas, while Jesus fed the seagulls some bread. Then it was back to the bus and the long ride to the ship. We all rated Jesus a 10 on 10, and one of us actually indicated he must be made the Governor of Cozumel! He richly deserves the honor. Certainly knows more about Cozumel than anyone on the planet. The pier had gotten very hot, humid & touristy, with several hundred cruise ship passengers shopping for knick-knacks. The Ryndam left the shores of Cozumel around 5pm, and we charted a course towards Belize. Very interesting to see those two large ships side-by-side! wonderful photo and story !